It was a challenging week, but the new defensive gameplay is in and working. 1. The speed of the game. Experienced players have to be able to play a game in 15 minutes. 2. The random influence of the cards. The normal ebb and flow of the cards has to remain prominent. 3. The Big Play button. I still want it to be an integral part of any new mechanic. 4. The visual of the players running toward each other. That might be my favorite image in the game, and it captures the feeling of football very well. In addition to preservation, I wanted to make the defensive gameplay seem more like real football in terms of strategy and flow. Last week, I came up with a new mechanic, and here's how it works. 1. It's down based, with first downs, just like offense (and real football). 2. The number of card slots is always the same. 3. After the user selects "Defend Run" or "Defend Pass", the CPU playcall is revealed. If the user matched the playcall, the maximum possible gain on the play is 15 yards. 4. If the user doesn't match the playcall, the maximum possible gain is 30 yards (there's the penalty for an incorrect playcall, instead of losing a card slot). In addition, there's a dice roll to determine if the "Big Gain" feature is activated. If it is, then the possible gain is 50 yards (and a little image shows, just like when a pass is completed on offense). If you click on that image to maximize it, you'll see that the min, mid, and max gains are now labels on the canvas. Before the play begins, the offensive player is positioned at the max possible gain. Plus, you'll see a different player depending on if the playcall is a run or a pass (in this case, it's a pass). 6. Then you play cards. 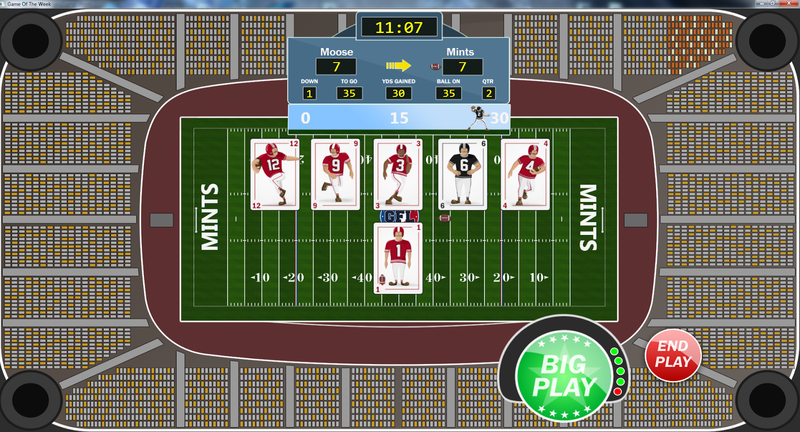 With each valid play, the gain is reduced by 2 yards (and the player will move backwards along the yardage scale, in addition to using a "running with the ball" pose, with different poses for running and passing plays). 7. If the gain on the play reaches the minimum (zero), the cannon sound and tackle animation go off. In the previous version, this only went off when a drive was stopped. 8. When you end the play manually, the gain is calculated. 9. Since defense is now down based, the limitations on kicks has been removed. So now you can punt or try a field goal as often as you want (and so can the CPU). What I particularly like about the new mechanic is that calling plays is incredibly important, and the CPU uses standard playcalling strategy based on down/distance/score/time (which is easier to comprehend for the human player, by far, than the previous version based on a fixed number of plays in the drive). It also means that even if you run out of Big Play presses, you can still stop a drive if you call plays well (you can stop one even if you don't, but the cards will have to run in your favor). The game is slightly longer now--about 20 minutes, instead of 15--but it's a much, much better game of football, and I'm hoping I can still shave off a few minutes. The cards still have their proper role, the Big Play button is still crucial, and there's a still a player running along the canvas, even though there's not a tackler running toward him anymore. By next week, I should have everything in and polished, and then gameplay is going to be largely finished. This is clearly the right mechanic, and I only wish it hadn't taken me so long to figure it out.